Today is the day I decided to try out a grocery delivery service. The fridge was bare and the cupboard only housed a few cans of beans. I fully planned to drive to the store- but a blizzard hit. Nobody needs me on the road driving in bad conditions- I haven't had to drive in snow in over 6 years. I would be one of those people I used to curse...like when Californians or Texans drive on ice for the first time. It's a learned ability. 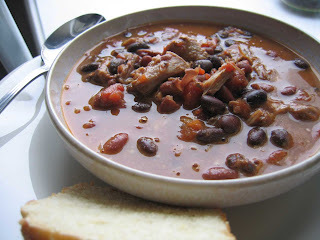 I was able to piece together this very humble soup- it's good and simple, but it would be nice to have more options than 2 can of beans and some nearly unidentifiable frozen meat. I made this soup in the crock pot, but on the stove would be just fine too. I'll let you know how the grocery delivery goes... so far it's not the same a perusing the aisles with a cart looking for something that interests me. And you don't get to feel the veggies or smell your fruits. And do you tip the driver? Oh, but they do deliver liquor... hmm, maybe there is something fat and happy about grocery shopping on line. Tips and Techniques: You can choose cheap cuts as long as they stew for hours; the longer you keep them stewing, the more tender they will be. Dried beans will be better than canned, if you have them. Season the meat, then braise in the crockpot for about an hour. Add in the remaining ingredients, cover and allow it to simmer for a few hours (or however long you have.) Use your tongs and pull out the hunks of meat. Tear it apart with a couple of forks and return to the pot. Serve with a simple bread.